> Centrify > Who Moved My Secure Perimeter? Before cloud computing, Software-as-a-Service, smart phones, tablets, and wearable devices, there was the data center. It defined an organization’s perimeter. IT established a secure perimeter around you and your organization’s sensitive information, protecting you from the rest of the Internet using firewalls, security appliances, VPNs and more. 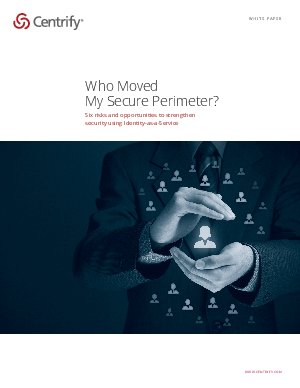 Now, your organization’s sensitive information is everywhere. If you looked, you would find it on mobile devices, in the cloud and, of course, behind your firewall. So where is your secure perimeter? This paper examines six common risks of this “perimeterless” world, and proposes six opportunities to strengthen security using Identity-as-a-Service.